The interesting thing, though, is that I am not alone. I have made mention in the past that one of my biggest complaints about the two party political system is that, more and more, each party is finding less and less to agree with one another. There are two different teams, and they are to never agree on anything. This very notion is easily seen in these two likely nominees. Donald Trump is the least favorable candidate to run for President of the United States since the time that the stat was actually polled and recorded. Admittedly, it hasn’t been for that terribly long, but since 1992 there have been none more unfavorable than The Donald. Despite Trump’s claims that he can be “so presidential,” 65.4% of Americans find Trump unfavorable, opposed to the 28.4% who would deem him favorable. To then take this one step further, Hillary Clinton is the third least favorable candidate since polling began in 1992, preceded only by, as already mentioned, Donald Trump and then George H. W. Bush the election cycle in which he was not reelected. 54.9% of those polled find Hillary Clinton to be unfavorable, whereas 38.4% find her favorable. 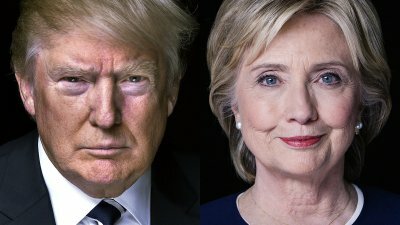 I find it mind boggling that in the game of politics, the two sides of the coin are going to be putting forward their most polarizing figures as their nominees. Many forget about the important role that moderates and undecideds play in the general election, and get caught up in the vacuum that primaries and caucuses create with their one party nature. It seems to me that both sides have forgotten that most Democrats will vote Democrat and most Republicans will vote Republican no matter who is on the ballot. The election will be won by the candidate who is found to be the most favorable by those with little to no party affiliation. Who is the most favorable of the least favorable of all time? This entry was posted in 2016 Election, American Politics, democrat, Republican, Trump and tagged Clinton, Donald, Donald Trump, Election, Hillary, Hillary Clinton, Politics, Trump. Bookmark the permalink.